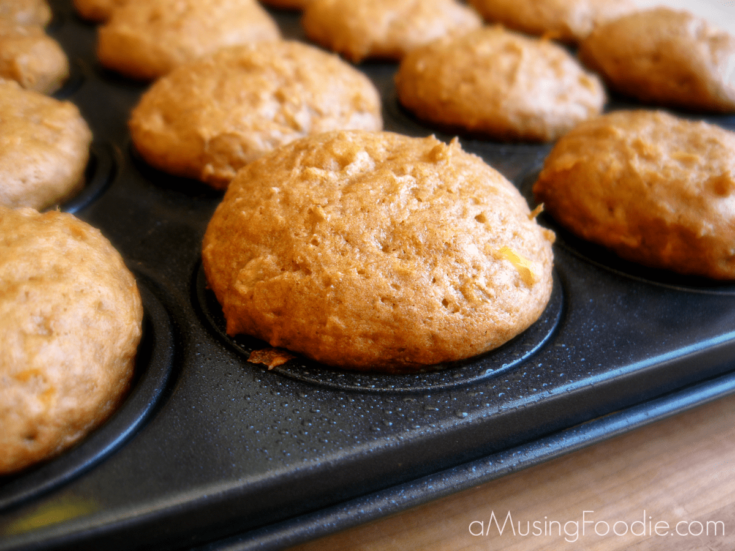 Egg-free zucchini bread mini muffins that taste like the regular? Yes, it’s possible! Over the summer I usually have an abundance of zucchini, both from my parents’ homestead, as well as leftovers now and again from my neighbors’ CSA share pickup. I’m not sure if the weather was prime for zucchini growing this summer or what, but everyone I talked to, from farmers to gardeners, said the zucchini plants were high-producing. I ended up with more zucchinis than I could manage, and so the question became: use them now, or freeze them for later? Using them got rid of some of my stash, working zucchini into meatloaf, marinara, bread, and roasted veggies. But there’s only so much fresh zucchini one family can eat over a week or two. Freezing them would probably be the better option, and I happened to read a tip that you could shred and freeze the zucchini without any blanching or prep work (aside from peeling and shredding). The beauty of frozen shredded zucchini is that it thaws in minutes right out on the counter, although you could also set the bag in some warm water to thaw even quicker. Shredded zucchini goes great in a variety of recipes (like all of the ones I mentioned above, except the roasted veggies), and freezing it in two-cup batches seems to be the perfect amount for most recipes. I decided it was time to make more zucchini bread; but, instead of a loaf I thought mini muffins might be a nice twist! Perfect to throw into my daughter’s lunch or for us to grab as a quick snack. Except … I realized after mixing the dry ingredients for my regular zucchini bread recipe that I was … um … OUT OF EGGS. Borrow eggs from the neighbors. Run to the store with two kids in tow. 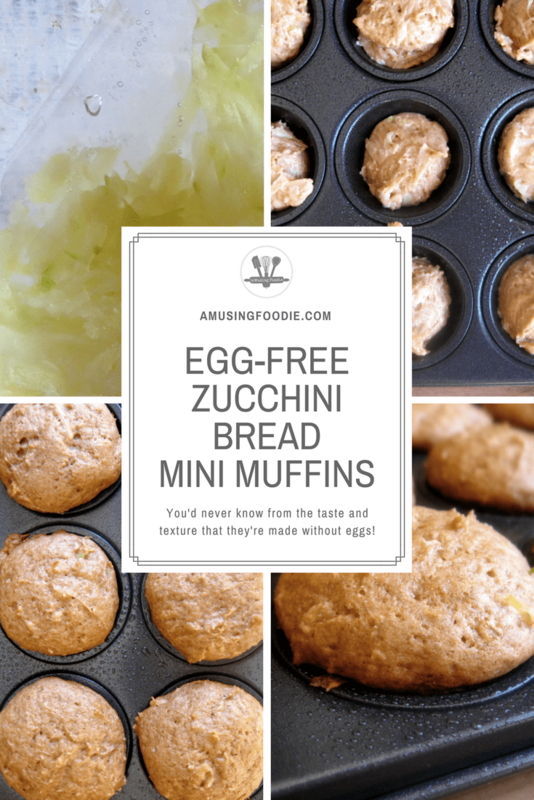 Find a way to make the zucchini bread mini muffins egg-free. Turns out, our neighbors were gone, and I didn’t have the energy to schlep the kids to the store, which left coming up with a way to make the recipe for zucchini bread mini muffins EGG-FREE. One thing I happen to have plenty of is plain Greek yogurt. I’ve read that you can substitute yogurt in place of eggs in baked goods, so I thought: What the heck? Let’s give it a go. I substituted a quarter cup of two percent Greek yogurt for each egg (whole fat Greek yogurt would be better), and followed the rest of the recipe to the letter, except I got a little crazy and added cardamom and nutmeg (because I LOVE cardamom and nutmeg with cinnamon in the fall!). The batter was the same texture as the egg version. And, surprisingly (actually, I’m not sure why I’m surprised, I just was … it’s the non-baker in me) they rose just fine. Just make sure not to over-bake them, so I started checking for done-ness within five minutes of the end time. She can’t tell the difference between these egg-free zucchini bread mini muffins and my traditional recipe. 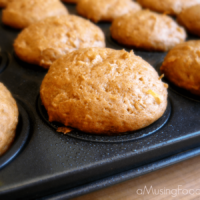 Egg-free zucchini bread mini muffins that taste like the regular? Yes, it's possible! Preheat the oven to 325°F. Use non-stick spray to coat two mini muffin trays. Use a whisk to combine the flour, baking soda, baking powder, cinnamon, cardamom, nutmeg, salt in a large mixing bowl - leave a bit of a well in the center. In a separate small mixing bowl, use a hand mixer on medium-high speed to beat the yogurt, oil, sugar and vanilla together until they're a creamy color (about 2 minutes). Pour the wet mixture into the dry ingredients, and continue mixing for another minute. Add the zucchini to the batter, and using the mixer on low, gently incorporate the two. The moisture from the zucchini should moisten up the batter and make it easier to mix. Use a small scoop to fill each spot in the muffin tin 3/4 of the way full, and then bake them for 25 minutes, or until the tops spring back when they're gently pressed and a toothpick inserted into the centers come out clean. Let the muffins cool for 10 minutes before removing them to a wire rack to cool completely. Found this tonight when we had no eggs!! I had a feeling I could use yogurt but thanks to you hubby didn’t have to run to the store–since HE finished the eggs without putting it on the list lol. I did adapt it tho, so we’ll see how they turn out. I used only 1/2 cup of flour and the rest gluten free oatmeal. I used 1/4 cup cococonut oil and 1/8 C vegetable oil and 1/4 cup extra yogurt. And 1/2 cup maple syrup, no sugar. Also added 1/4 cup cranberries and 1/2 cup chopped walnuts. Sprinkled flax seeds on top. If needed, I’ll glaze the top with honey for added sweetness….15 more minutes til taste time…. Pray? Ha. Oooh! Love those additions — let me know how they turn out! Yum, I have a fresh zucchini on hand, I will for sure make these! I plan on making this coming weekend but I want to make 12 regular muffins so I guess I should halve it. So the batter is quite thick, eh? Farzana – it’s pretty thick until you add the zucchini, and then it becomes like a more normal batter consistency. Good luck! Thanks for replying quickly 🙂 I’m gonna actually make this tonight. My almost 4 year old cannot have eggs. I have made quite a few cakes but not zuccini and I would love for him to get more veggie in his diet. I am just wondering about the 1 cup of oil though. Seems like quite a bit. I wonder if I reduce it, if I have to sub it with something else. Do you know anything about this by any chance ? I have successfully reduced oil in the past and not have had to sub it, but I was thinking maybe this might be different. Usually I just add a tad bit more yogurt or applesauce. Any suggestions ? Welcome! Even though this recipe calls for a bunch of oil, I certainly don’t notice it having an oily feel or taste. Having said that, I would definitely increase the amount of yogurt and/or add applesauce, or even some mushed banana – all good options. Hope they stay moist and delicious for you! My incredibly picky eater–won’t eat anything green to save his life–loves zucchini bread and because he loves it there he will now eat zucchini in all incarnations! Pinning this one! LOL – don’t you hate that? Lanie – do you need to omit the eggs? Also, I was going to try to use EnerG Baking Soda to substitute for regular baking soda in keeping with the low sodium theme. I have a severe egg allergy so trying to come up with replacement ingredients without compromising texture and taste is so hard. Hmmm… Okay, so do you just not have yogurt on hand, or do you have a dairy allergy/intolerance too? Dairy intolerance also. I heard that avocados could be used but not so sure about that, guess I could try. Avocados are not a bad idea – they’d add a little extra fat, plus some moisture. What about coconut oil? This was second recipe I tried and was AWESOME! Seriously didn’t know they didn’t have eggs in them. SO GOOD. Will definitely make them again. Oh my god these were amazing!! Definitely a keeper.. thank you so much. I loved this recipe, the muffins turned out awesome. thank you! i added chocolate chips to some, and that was nice too. Thanks again! Yum! Chocolate’s a great add! Hi there . .. i want to try these but I cannot use sugar or sugar replacements. Do you know if it would still work? The recipe would be fine without sugar. You could try subbing applesauce or something similar, if you want!